Of all times of the year we learn during Remembrance week that a brave andcourageous British soldier of excellent record has been tried and found guilty of murdering in the heat of a fire fight an unarmed member of his enemy, an enemy who would not have hesitated to do the same had the circumstances been reversed, a fact proven by it now being necessary to place an armed guard to watch over the soldier’s family. Those of us who lived through WW II and whose fathers fought in the Great War are in full knowledge that in warfare such things happen. Obviously such actions must not be condoned but they must be viewed with licence and discretion for such is the nature of warfare. Soldiers understand these things but clearly the politicians safe at home have no such understanding or compassion for those they commit to engage in stressful conditions of unimaginable savagery. It is well recorded that in two world wars the Germans brutally murdered in cold blood countless numbers of unarmed prisoners of war and civilians. Allied prisoners were lined up and machine gunned, women and children locked in buildings and burned to death, and ignorant peasants publicly short-fall hanged in the streets. Thousands of allied servicemen and women gave their lives in the struggle to overcome this brutal and barbaric enemy. Despite this, in 1972 the Conservative Party then in government signed away this nations sovereignty in an act of capitulation to the German inspired and controlled European Economic Community, or the Europaische Wirtschafts-Gemienshaft 1942 as in reality it was formerly known, and covered its treasonous action by lies and deceit. This same Conservative Party again in government and again showing its anti British colours has now, in an act of false piety and its own twisted version of political correctness, chosen to ruin the life of one of our brave heroes and the lives of his family whilst those safe in government recline as petty Caesars in the luxury of their obscene stolen salaries. 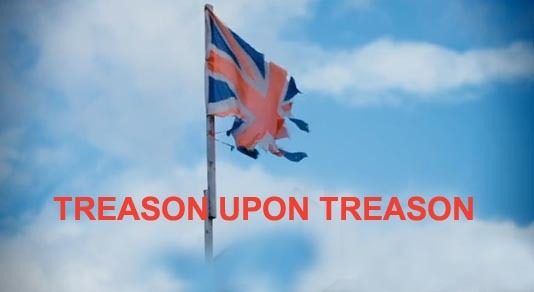 Tagged British Constitution, British Forces, conservative party, David Cameron, labour party, Liberal Party, New World Order, Nick Clegg, Poppy Day, Royal Family, Treason, ULTIMATE TREASON and BETRAYAL. Bookmark the permalink.